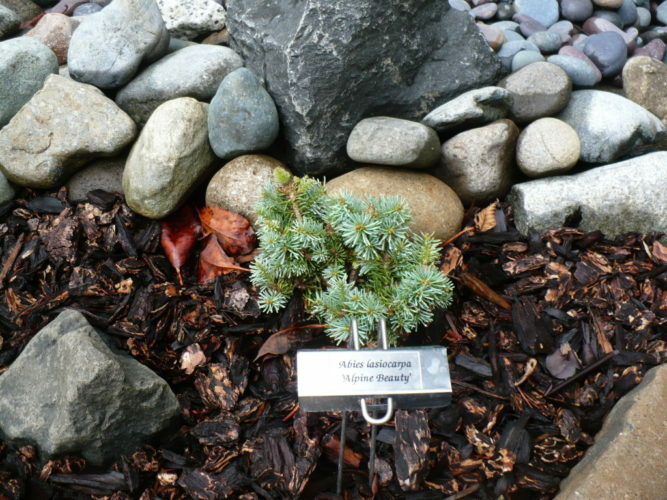 Abies lasiocarpa 'Alpine Beauty' is a very choice selection of Alpine fir. When young, the plant is quite globose and symmetrically branch, becoming conical, but still quite dwarf as it ages. Yearly growth is only around 1 inch (2.5 cm), producing a cute little cone of about 1 foot (.3 m) tall after ten years. The silvery-Blue foliage appears both soft and lustrous and it densely needled, obscuring the branch structure. Jerry Morris of Ft. Collins, CO found the witch's broom from which came the original propagation material for 'Alpine Beauty.' This selection is part of Jerry's Rocky Mountain Collection. Larry Stanley of Stanley & Sons Nursery, Boring, Oregon introduced it to the nursery trade through a program he started with Jerry.